Finally I’m here with my report of may 15th. I have to be honest with you and say I had to hold myself in so I wouldn’t write every single detail down of the whole day. The Sims 3 is amazing, I already know I will be spending hours and hours on the game when it comes out! Luckily I have the first 3 weeks off from work in the summer vacation so I can focus on playing the game. I can’t wait! If you want to read about what I’ve been doing on may 15th click on the part ‘lees meer…’. I have to confess I have been living in a dream for my feeling at the The Sims 3 event. The fact that we could simply play The Sims 3 for like 5 hours was unreal. While it’s of course very special, not everyone can say they have been able to play the game. Still, that feeling couldn’t reach me that specific day. Now, one day later I have some effects left of playing the game. For example: I keep thinking I want to try out more things because I haven’t seen everything yet. Realizing I can’t because the game isn’t even out yet! Not very handy, now is it? That day I arrived later then everyone else, but I didn’t have to worry about a thing. When I arrived they weren’t playing The Sims yet, as if they all waited for me to arrive. They were all standing because there wasn’t a single chair in the hall where everybody was waiting. That was okay though, we were able to sit behind the computer to play The Sims 3 the rest of the day. When we finally installed ourselves behind the computer we first had to listen to MJ Chun and the Sim she was playing with. I couldn’t do that though, I was too focused no playing the game. I have no idea what she said anymore. Kiara_xx won a price on eagames.nl, the price was to attend the event as one of the Sims fan from the community. Together with Kiara I made a male Sim, named ‘Otje Smurf’. We wanted to try everything out from CAS, we totally have outdone ourselves by making the world’s most beautiful clown with female make-up. (Forget about the red nose by the way, that one wasn’t available in the game, unfortunately.) That way we found out that you can change the colors of bracelets in CAS. Otje doesn’t have any jewelry though. I did got to answer a question one of our blog readers asked us to find out. Yes, there is a slide bar for eyelashes. You can make them taller or shorter, whatever you like the most. Otje has very tall eyelashes, very beautiful. The character traits of Otje were: good sense of humor, insane, over emotional, great kisser and childish. Real clown traits! Oh, and his life wish has something to do with taking over the world, in a very evil way. When Otje was finished in CAS I put him in a house. We have been to a couple of places, one of the places was the gym. There was a pool and Otje had the option to fish in the pool, which he did and loved by the way. Of course he didn’t catch anything but he did see Miss Crumplebottom. This was his chance to flirt with her and to make a very first friend. That went very smooth, she even thought he was very attractive! Please, read this report again on june 2nd, after you’ve seen Otje in Exchange. Only then you will know why Miss Crumplebottom thought Otje was attractive. While Otje was flirting with her I found out you can find out whether a Sim is single or not. There is a option to ask, which is great. This way you will never have to guess if you are destroying another family by flirting with a mother of two children for example. One of our blog readers was wondering if there were much more romantic options for our Sims to do. I can say there are lots of them now! Especially if you have the romantic trait. Of course you have the old general options, like making a joke or telling a random story. But you can now for example give detailed compliments about something. Like giving a compliment for the bravery a Sim has, or the way a Sim has been training in the gym, and so on. You have to know Otje is one of the fattest Sims in the game so far. I wanted to see what he does with training in the gym. One notice: I didn’t see any bar where you could look at how long a Sim has to train to get thinner. So it’s a guess how long your Sim will have to train. Otje didn’t get any weight up, his condition was too bad for it. I wonder if that will be different if you have more condition as a Sim. Anyway, Otje said to me he wanted to train till 11:30 PM, until he was very tired. That was a no go for me, there was still so much to find out! While playing with Otje I got a message of doing something for Otje. There was this football game in a stadium which Otje wanted to see badly. I could accept on sending Otje there or not. Of course I accepted, so I went looking for the stadium. After Otje went to the game I had to wait outside. Luckily there is this “time bar” that fills up through time. To let you know how long it takes before Otje comes out the stadium again. When he came out he started playing the game “tag” with another grown up. The funny thing was that after Otje ran for a little part to catch the other Sim he was out of breath. With that I also wonder if that changes when the condition of the Sim is better. Another cute and funny fact is that Otje had a good relationship with a child who delivered papers every morning. She came on the bicycle, lay down the paper and left on the bicycle again. When getting the newspaper outside I could also see one of my neighbors, going outside to get the paper. Which is fun, it really gives you the feeling of the neighborhood being alive. At this point I was a little bit done with Otje. I wanted to see how Miss Crumplebottom was living, what her traits were, and so on. Between us: she has a gorgeous and luxury house! Her traits were: einzelgänger, bookworm, hopeless romantic, moody and schmoozer. She was the happiest if she was spending time, all alone in her own house. Her face went from happy to really not happy in a public place with lots of other Sims. Traits that not go well with the wish of going to the public library. The funny thing is that Miss Crumplebottom didn’t got one option like Otje had, but two in the meanwhile I played with her. The first one was getting a phone call from a restaurant in the game. They asked her to re-decorate the place with paintings on the wall. She had the ability to spend 450 Sim dollars on it. After she bought the paintings she had the option to deliver it to the restaurant and get money for her service. I let her buy a part of the business right away as she was rich and could get a good income of it. The second option she got was a sale in a bookstore. She had 5% off on all the books if she would buy some the very same Sim day. Of course we couldn’t pass on that one since Miss Crumplebottom is a bookworm. One of our blog readers had the question if you could buy separated items in the supermarket, and I have the answer. Yes, you can! You can buy ingredients like hamburger, lobster, birthday cake, and more. But you could also buy recipes which would learn you how to make spaghetti, hot dogs, and more. The items were also separated in categories. Which makes it simple to find certain things, like fish or vegetables. By the way, there was also an item for sale which I think you could use in the hot tub. For getting more bubbles or something. I couldn’t try out, unfortunately. I’ve also tried out to talk with the hubby ghost of Miss Crumplebottom. His tombstone was in the front yard which allowed the hubby ghost to get out the tombstone in the night. Miss Crumplebottom could talk with him, flirt with him, actually everything you can do with any other Sim as well. But you do need to have some patience with ghosts. If they start haunting in the house they go into items. For example the couch. The couch will then start floating and shaking, no option to click on the couch to call the ghost or anything. You’ll have to wait for the ghost to come out of it so you can click on him/her. The weird but funny part of it was at the end of the night, the sun was coming up and Miss Crumplebottom had been talking and flirting with the ghost all night long. At some point the ghost started yelling he needed to go to bed. Right.. what a surprise. I’ve never seen that before. What I found very beautiful were the graphical touches the ghost got. You could see this man died from something with water, most likely he drowned himself or something. His appearance was as if you were looking at the reflection of water in a river, moving because of a little breeze. He also leaked water drops. Luckily he didn’t leave little water pools in the house, like they did in The Sims 2. I was wondering how I could get the hubby ghost into the household as playable. I could’ve sworn I read something about being able to have a playable ghost. Kiara told me I should go to the science building, something there could get the ghost into the household as a playable one. We couldn’t find anything though, not a single option to do that. So this is a goal for when the game officially gets released. We were also asked if we wanted to explain in 1 minute in front of a camera what we like about The Sims in general. Which was drama because how do you define the ‘amazing factor’ of the game in only 1 minute? Not everyone wanted to explain this in front of a camera, I did though. At the end of the day the press also arrived to take pictures of us all, receiving the gift and playing the game again after the group photo. It was suddenly a whole happening which I didn’t like very much. For my feeling I couldn’t play the game that well anymore, since there was everytime a camera, trying to take a picture of your face while playing the game. So I gave my seat up to Kiara. We shared the computer the whole day. EA people asked us to make something for the Exchange that would open up on June 2nd. They thought it would be nice if we, as Sims fans and website owners would’ve created something for you all to download when the game gets released. I already made Otje Smurf mostly with Kiara. Now it was her turn to make something. She chose to create a very cute and little house. I helped her a little bit, mostly giving my opinion on things. It’s a very cute and little house, for single Sim girls. It’s romantic but also very pink! So stay tuned on June 2nd because I know Otje wants to meet you all, and since he has a female side he might even want to live in the little but oh so cute house we created. For my feeling it takes a little while before there are other NPC’s in a public place. It starts up slowly, just as in The Sims 2. But if could also be because of the appearance of Otje.. 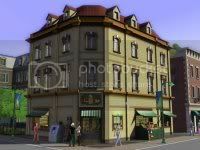 It will always and forever be a sad point that we can’t follow the Sims inside a building. It takes away the situation you could be a part of, like everything else in your Sims life, because you can’t follow them into a shop, work, and so on. For me it’s all about the small details in the game now. You really start living together with your Sim as much as possible. On May 15th I already felt very close to Miss Crumplebottom. For example, I let her post a flame post on a forum on internet. It said I have to check back later to see if any other Sim reacted to her flaming post. Unlike The Sims 2 there wasn’t a reaction right away, you really have to wait a couple of Sim hours or maybe even a day before you check back and see change. I totally forgot about it and the next day of the event I thought: “Oh shoot! I forgot to check if anyone reacted on the forum post!”. You could also see on her face and mood what she wanted and what she didn’t want to do. And really, you could see it VERY clear. As a real Sims fan you will not be able to just overlook that fact. I want to thank EA for inviting me to this event. I appreciate it and loved it. I will never forget it and I hope to see you all again in the future! MJ Chun, you are the best! Thank you so much for everything and keep up the great work. Now it’s over to the waiting part, waiting for the game to be released. Tik… tak… tik… tak….